Our first glimpse of Trivandrum was of gracious colonial buildings and lush greenery. Trivandrum still has an old world charm to it as we discovered once we set about exploring it. Our first sightseeing stop was the famous Sri Padmanabhaswamy temple. This temple, with its magnificent carved entrance, dates back several millennia and is one of the oldest and richest temples in India. Close to the temple is the royal palace as well as an art gallery. The beautiful teak carvings, sculptures, paintings and gardens make for an interesting visit. Kerala is also home to an ancient community of Syrian Christians, said to date back to the arrival of the first apostle Saint Thomas, in AD 52. There are many lovely, historic, old churches in and around Trivandrum with beautiful interiors and a pervading sense of peace. One of the churches, just outside of Trivandrum is said to have been built in AD 79, in the exact spot where Saint Thomas preached to his congregation. Part of the original stone structure still stands, as can be seen in the pictures below. When we visited at Christmas time, the colourful decorations added a nice festive feel. Kerala cuisine too, is an interesting mosaic of its diverse history and you will come across many dishes reflecting its Muslim, Christian and Hindu heritage. A fun way of diving into Kerala cuisine is by ordering a thali. It comes with an array of many different curries nestled on a banana leaf - aromatic lentil and vegetable sambhar, creamy coconut chutney, crunchy cabbage thoran, spicy tomato rasam and so many more. It is a great introduction to the incredible variety this cuisine has to offer. 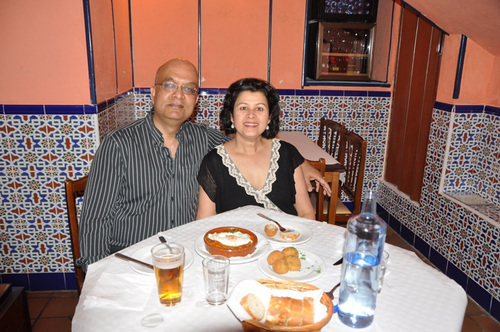 However, it was the fantastic seafood curries that had us hooked! We loved the spicy, sour fish curry as well as delicate stir fried calamari with caramelized onions, spicy tomato shrimp, fish fry with curry leaves and our favourite dish - Karimeen. A local variety of fish known as pearl spot is marinated in a sauteed onion tomato paste, wrapped in a banana leaf and seared on a hot tava or griddle. The spicy, smoky flavours of Karimeen are unforgettable! We often ate these curries with another favourite, appams. These are lacy, crisp rice and coconut pancakes with an addictive spongy center. We could (and did) have them with every meal! One of the best ways to start your day in kerala is with a traditional breakfast. This is when delicious dishes such as idlis (steamed rice and lentil cakes), dosas (crisp fermented rice and lentils pancakes), uthapams (thick rice pancakes topped with onions, tomatoes, green chilies and curry leaves), appams, curries and chutneys make their much awaited appearance. At the Taj hotel, where we were staying, I discovered a new favourite - Ramassery idlis. Never having come across these before, I was captivated by their soft, melt in the mouth texture. Named after the small village of Ramaserry, where they were first created over a hundred years ago, these thin, flattened idlis are steamed in a fine muslin cloth inside an earthenware pot. Their soft texture and earthy aroma are unique. Although this is a disappearing tradition, the Taj hotel Trivandrum is keeping it alive by training their chefs in the authentic, age old way of preparing these idlis, much to the gratitude of all those who get to eat it! The Malabar mutton biryani at the Taj hotel, was by far the best biryani I have ever eaten. When I mentioned this, Executive chef Jose Thomas very obligingly gave me his special recipe! While fresh Kerala spices definitely give this dish its unique aroma, sprinkling the cooked rice with powdered masala, before layering it with the lamb curry is key. Sous chef Hari Krishnan uses biryani masala for this purpose. While you can buy that in most Indian stores, I recommend making your own Malabar Masala, for even better flavour. Making a biryani can be a bit labour intensive. It helps to make the lamb curry a day ahead. Not only does that save time, it also improves the flavour! Serve biryani with a simple yogurt raita or Wilted Spinach Raita, salad and pickles, as is traditional in Kerala. If you would like to make a vegetarian biryani, try this delicious Dal Biryani. Mince garlic, ginger and green chilies together in food processor. Transfer to a small bowl. Puree tomatoes in same food processor bowl, transfer to another bowl. Reserve. Warm oil and butter together in deep skillet set over medium high heat. Add half the sliced onions and saute until golden brown, about 8 min. Add cashews or almonds and raisins to onions in skillet and saute for 1 min until raisins plump up and nuts are lightly fried. Drain from oil, transfer to a plate and reserve for later use in the recipe. Add remaining sliced onions to same skillet over medium high heat; saute for 5 min. Add lamb or goat and brown for 5 min. Add minced ginger mixture; saute 1 min. Add pureed tomatoes, salt, half the garam masala, turmeric and cayenne. Saute 5 min until slightly thickened. Add labneh or yogurt and stir for 2 min until smooth. Cover skillet and let mixture start bubbling. Reduce heat to low and cook for 11/2 hours or until lamb is very tender, stirring occasionally. The sauce should be very thick and clinging to the meat by this time. Mix in remaining 1/2 tsp garam masala, chopped fresh coriander and lime juice. Wash rice well, then soak in enough water to cover for 15 min. Drain well in sieve. Reserve. Warm oil in deep heavy bottomed saucepan over medium high heat. Add whole spices and cinnamon stick. Let sizzle for 1 min, then add sliced onions. Saute for 8 min until lightly browned. Add drained rice to pan and saute 1 min to toast it lightly. Add salt to taste and 1 1/2 cups of water. Cover, bring to a boil and reduce heat to very low. Cook rice undisturbed for 10 min. Sprinkle biryani masala or Malabar masala and garam masala over top, fluffing rice gently and mixing it in. Preheat oven to 300F. Lightly grease a 9X13 inch oven safe baking dish. Spread a thin layer of rice in bottom of dish. Top with all of the lamb curry, distributing it evenly over the rice. Top with remaining rice, spreading it gently and evenly over top. Sprinkle reserved fried onions and nuts over rice. Dot with butter. Cover pan tightly with foil and bake for 1 hour. Remove from oven and transfer biryani to a serving platter, fluffing rice and mixing in the layers gently as you do so. Serve right away.